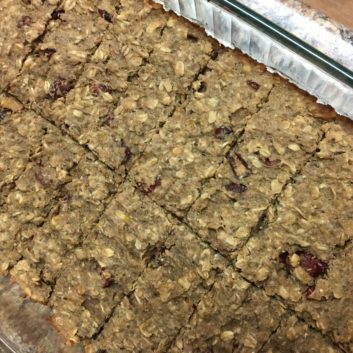 I love lentils, and enjoy adding the super food into a variety of recipes, including granola bars. It’s an easy (and sneaky) way to increase the fiber and protein of a favorite snack food. And try this kitchen hack: Coat your measuring cup with oil spray before measuring honey, peanut butter and other sticky ingredients so they just slide right out. Combine lentils with 2 cups of water in a pot over high heat. Bring to a boil, reduce heat to low, cover, and cook for about 10 minutes, until the lentils are tender. Allow to cool. Press the mixture evenly into a casserole dish liberally coated with oil spray. Bake for about 25 to 35 minutes, until the center is very firm to the touch and the edges are lightly browned. Allow to cool slightly, then cut into bars.